Went with dad in the morning for what we were hoping would be a dry few hours. The rain was bucketing down as we were driving there and we were thinking about turning back. We went on and to our surprise, the weather cleared as we hit our spot! Within the first couple of casts, something substantial hit us at speed! It was a slimy mackerel, the first in a while! While we were hoping there’d be a whole school of them around, we were disappointed to find that it was the only one of the day, probably just passing by! Towards the end of the day, we were hit by another steam train! we thought it was a slimy again, but this one had more of a fight to it, as it turned out to be a legal tailor. Don’t get many of these fishing from the shore! All up, I caught about 15 in succession cast after cast, until the worm started to rip due to the sharp teeth of these feisty tailer. My brother only managed about 3 in that time, so maybe the claim that Berkley makes about outfishing bait is true after all! Anyway, it’s a different ballgame with other species like bream. I hope to report on more soft plastics in the near future. Took time in lieu on Monday after a long week’s work and went to go fish with my brother and dad down at Clifton Gardens. The weather had a beautiful spring feel about it, but the wind was quite strong at about 20km/h winds. We started at about 10am but the action was dead. Not a single bait fish in sight. After waiting until about 2pm, the action finally picked up. 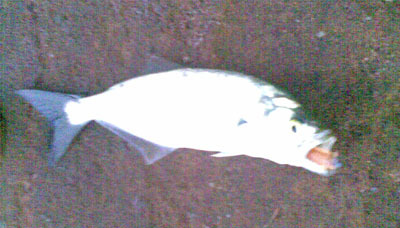 The trevally were schooling, all about the 25cm – 30cm size. They all put up a great fight on the light gear we had, and after dumping many back, we were able to come away with two legals at 32 and 35cm. My brother was also able to hook up on a legal tailor with a soft plastic, a Berkley Gulp 6″ sandworm cut in half. 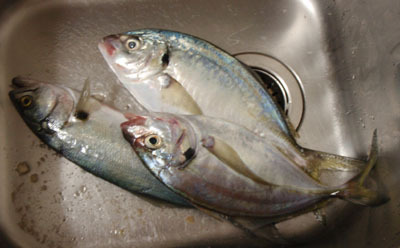 Towards the end of the day, we managed to get 3 squid, and put them out fresh in hope for a kingfish, but no luck there.